Those who appreciate Fort Lauderdale’s historic sections, and wish to call this area home, need look no further than the latest venture by partners Ocean Land Investments – AquaBlu. This new building is offering 35 luxury 2 or 3 bedroom apartments ranging from 2,547 to 4,184 sq ft. AquaBlu is located at 920 Intracoastal Drive in the heart of Fort Lauderdale’s waterfront and adjacent to the city’s historic Bonnet House Museum & Gardens. 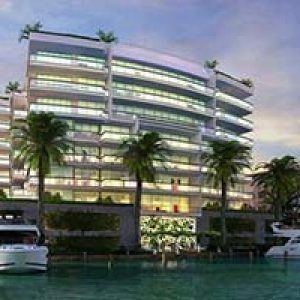 AquaBlu will offer the beautiful waterfront access that South Florida buyers have come to expect as well as 10 private boat slips and over 30 units with unobstructed views of the waterways and beach. Each unit is pet friendly, smoke free, and includes oversized balconies, glass enclosed showers, spacious walk-in closets, and chef kitchens with quartz counters and the finest in high end cabinetry. The designers have also included several modern, high tech features including smart technology in each unit, Wi-Fi in all common areas, and an electronically secured garage with electric car charging spaces available. Other on-site amenities include a private Zen garden, barbeque area, storage facilities, state of the art fitness center, expansive game room, and a heated pool. Additional features are expected as final construction progresses. The Indigo Floor Plan is located on the East side of the building, overlooking the beautiful Atlantic Ocean, in the center of the tower. This 2 bedroom, 2 bathroom unit has a full-sized Den and 2,547 total square feet of living space. Indigo provides a massive 29×17 foot Great Room as well as a 18×14 foot Master Bedroom that opens up into the 411 square foot terrace. The private foyer entrance connects to the unit’s private elevator, and the unit is accessible by stairs or by elevator on the 6th-16th floors. 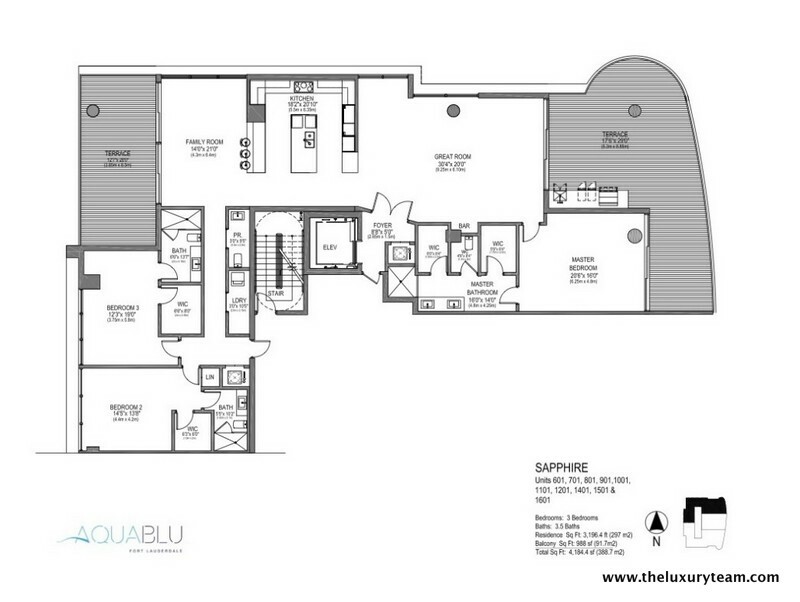 The Sapphire Floor Plan is a much more expansive take on luxury living at the Aquablu Fort Lauderdale. This 3 bedroom, 3.5 bathroom suite totals 4,184 total square feet and contains two expansive terrace areas on the east and west sides of the unit, allowing you to enjoy both the beautiful sunrises and sunsets South Florida has to offer. The 30×20 Great Room opens up into the Kitchen and a full-sized Family Room measuring 14×21 feet. Each bedroom in Sapphire features it’s own private bathroom and walk in closet space. The 968 total square feet of outdoor terrace space is plenty for cooking, entertaining, or lounging in the sun. 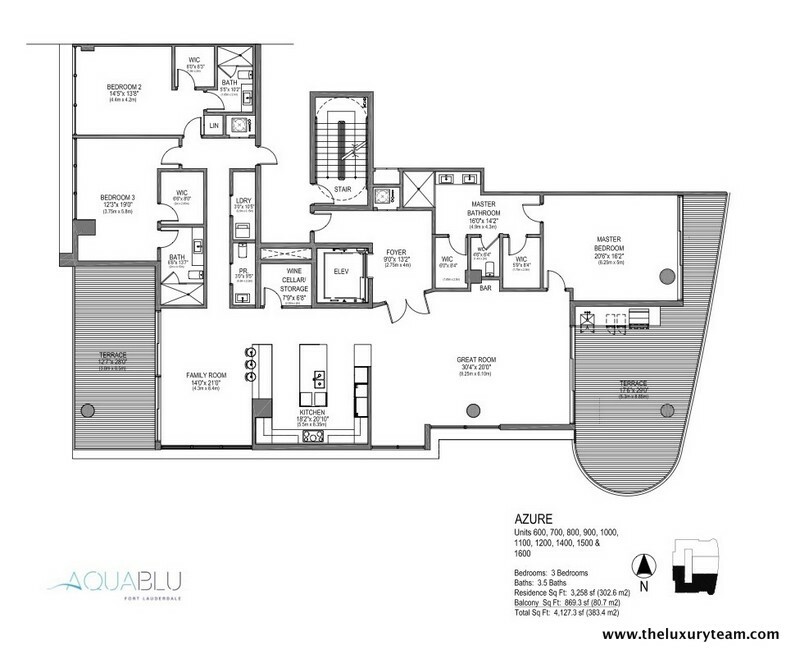 The Azure Floor Plan is the most expansive and luxurious available at Aquablu Fort Lauderdale. This 3 bedroom, 3.5 bathroom luxury residence provides 4,127 total square feet of living space and is situated on the South-facing side of the building. The dual terraces on either side provide pristine sunrise and sunset views, as well as optimal light at any time of the day for terrace gardening. The 30×20 Great Room is the focal point of the unit and opens up into the expansive 18×20 Kitchen with marble countertops surrounding the room for plenty of cooking surface. Both the Master Bedroom and Family Room offer direct access into the unit’s terraces, which provide 869 total square feet of space for cooking, lounging, entertaining in the sun. Fort Lauderdale’s Bay Front area provides a unique opportunity to enjoy some of Southern Florida’s most unique cultural, dining, and outdoor treasures. With a wide variety of dining options including Anthony’s Coal Fired Pizza, fresh seafood at Coconuts Waterside Grill, or something sweet from Kilwin’s Ice Cream and La Crepe, you will want to occasionally leave your chef’s kitchen behind and enjoy the creations of some of the area’s best chefs, who often utilize fresh area produce and seafood. Of course, the beaches and waterfront is at your doorstep as well and will be a definite draw for anyone who has ever witnessed a sunrise from the white sands. Travelers can rest assured that AquaBlu offers easy access to the world outside Fort Lauderdale, with close proximity to major highways and Fort Lauderdale International Airport. Likewise, nearby Pompano Beach and Hollywood are but a short drive away as well. Fort Lauderdale is more than a Spring Break destination, it is a jewel of Southern Florida beach living and AquaBlu provides residents an opportunity to “experience the privilege of waterfront living.” Visit, stay, and call AquaBlu your home of the future – now. What can be found near the AquaBlu? Located in the heart of Fort Lauderdale’s Historic District, and just a few miles from world-class beaches, shopping, nightlife, and dining, the Aquablu has something for everybody. AquaBlu’s excellent location puts potential residents in the heart of the best the Bay Front has to offer, and much of it is within walking distance from the front door. Whether it is the neighboring Bonnet House Museum & Garden, nearby Hugh Taylor Birch State Park, or the Galleria at Fort Lauderdale, you will never find a lack of experiences awaiting you. 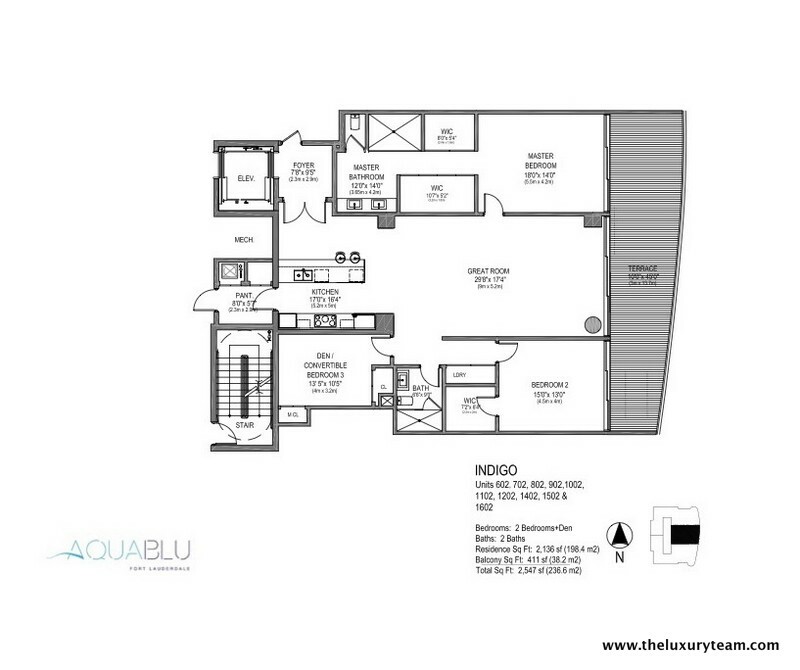 How do I buy one of the AquaBlu condos for sale? We would love to help you with that. Our agents know the condo market in Fort Lauderdale. We can help you find the best promotions and get into the condo of your dreams.